In the e-commerce industry, social proof helps build credibility and trust, making it a powerful tool that sets you above your competitors. Online customers can’t see your products or your team in real life, so instead they rely on feedback from others. In a nutshell, people feel happier to buy from an online store that other consumers are also happy with. Google Customer Reviews is a free service that allows potential customers to see exactly how happy those other consumers are. This service was first launched as the Google Trusted Store programme in 2011. 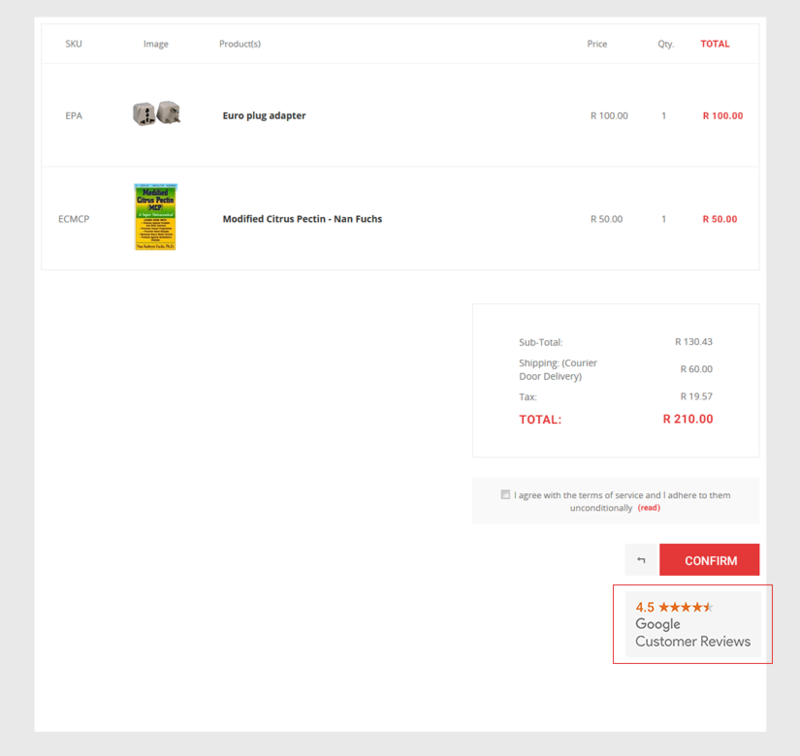 At that time, it focussed mainly on shipping and customer service data and relied on getting this information from the online retailer themselves. The process was complicated and required disclosure of sometimes sensitive information. Not surprisingly, many retailers chose not to participate. There were a few improvements made to the process over the next few years. Then in 2017, Google decided it would be more accurate and pertinent to gather information from customers than from retailers, and Google Customer Reviews is launched. According to the Local Consumer Review Survey 2018, 57% of consumers will only use a business if it has 4 or more stars. If you have no stars at all, how can customers know if your business is any good? 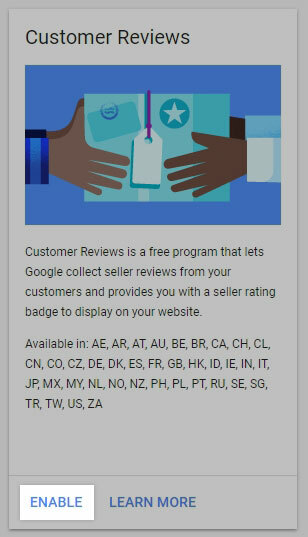 You can choose to display a badge on your storefront that shows you have been reviewed by Google, and what the results are. If you have enough reviews and a high enough star rating, the results may also appear as seller ratings below any Google ads you pay for and on Google Shopping. Your rating gives you feedback about how well your e-commerce site is doing in the eye of the customer, and whether you need to make some changes. This proof from other consumers that you offer quality products and services, and that your e-commerce site is safe to buy from, gives peace of mind to your customers. It also shows that you welcome customer feedback. All of these help build trust and improve your conversion rates. Customers are far more likely to buy from you than from a competitor whom they know nothing about. How does Google Customer Reviews work? After a customer checks out on your site, they are offered the option to give feedback. 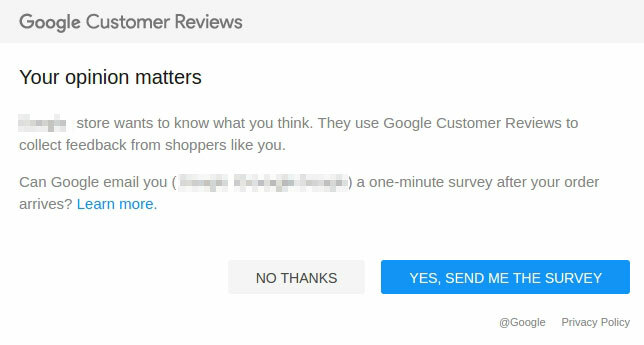 If they opt in, they receive an email containing a brief questionnaire that allows them to rate their experience with your e-commerce site. Google calculates an average rating using this feedback, along with information gathered from its own performance research platforms and several independent review websites. This average rating is displayed in a badge that you can place on any page on your site, helping customers to identify high-quality online stores. When customers click on this badge, they can access more detailed information about your reviews. If you have more than 150 reviews in the last 12 months and an average star rating of 3.5 or more, your seller rating may also appear on any paid advertising you do with Google, such as text ads, and on Google Shopping. This does depend on several other factors though, including auction dynamics. Can anyone set up Google Customer Reviews? If you are not based in one of the supported countries. In these cases, Google is unable to gather the information it needs to work out a rating for your site. An alternative tool to explore then could be something like Reviews.io. If you have been receiving many negative reviews: Respond to these quickly, and analyse the feedback to see what you can do to improve matters. If you don’t yet have enough reviews (you need 150 in the last 12 months): Hide your badge for now and keep checking on it, so you can see when it starts displaying ratings. Go to the Google Merchant Center here. If you already have a Google Merchant Center account, sign in. If not, take a few minutes to complete the sign up process. Download the HTML file and send it to our Comalytics Helpdesk so we can upload it to your website. 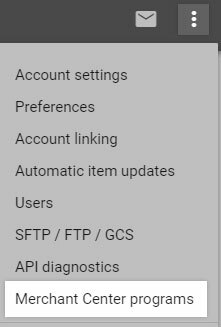 When we let you know the upload is done, confirm it by visiting the page link displayed in point 3 on your own Merchant Center page (see the relevant section highlighted in the red box above). 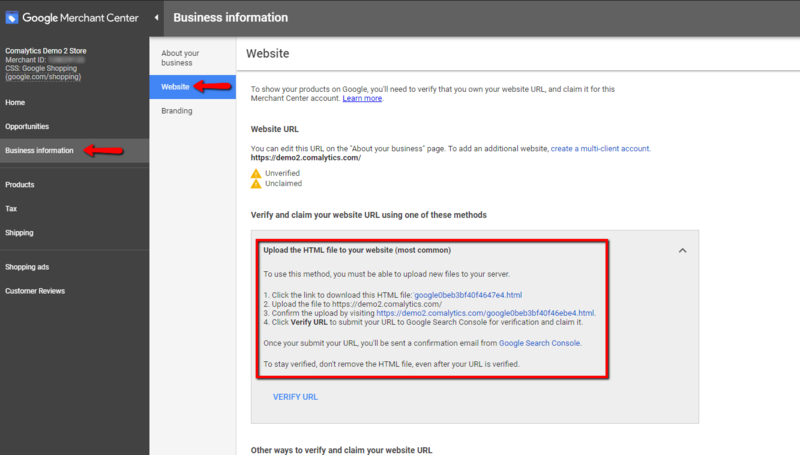 On that page, click “Verify URL” to submit it to Google. You will then receive a confirmation email from Google Search Console. Do not remove the html file – this is required to stay verified. In the left hand menu, click on “Home”. Locate the three dots in the top right-hand corner of your screen and click on them. From the dropdown menu that appears, select “Merchant Center programs”. Under “Customer Reviews”, click on “Enable”. A Customer Review program agreement will appear. Read it, then tick the box to confirm that you have read and agreed to the terms. Then click “Save & Continue”. Customer Reviews will now appear as an option in the menu on the left. On this page, you will find “Opt-in Integration” and “Badge Integration” scripts. Copy both scripts and send them through to our Comalytics Helpdesk so we can add them to your website. Note: If no rating appears on your badge immediately after the scripts have been added to your website, this does not mean the badge has a bug. Keep in mind that you need at least 150 reviews in the past year. Once you have those, your seller rating will appear. What else can I do with Google Customer Reviews? If you have a look at the dashboard, you will see there are several other tools and programmes that you might like to take advantage of. For example, if you would like to get your products listed on Google Shopping, you can find out more about that here. You can also check if you have a seller rating by going to this page. Where you see “example.com”, write your own domain name (without “www”). Trust is a non-negotiable factor for any business operating in today’s crowded online world. 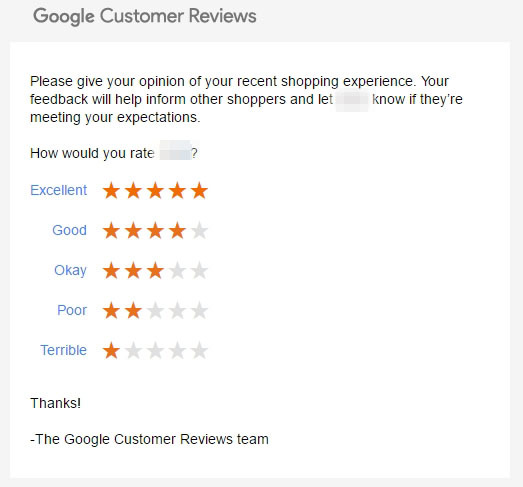 One way to earn that trust is to implement Google Customer Reviews on your e-commerce site. For consumers trying to make a decision about where to buy what they are looking for, the Google stamp of approval can often seal the deal. In the process, this improves your conversion rates and boosts the success of your business.